CyberSharks.Net has support technicians ready to help you when an issue arises. We've also got a Sales and Design Team that would love to help you get your newest project started. Check out our Quick Contacts listed here or fill out a Support Ticket right here! For more contact options, click the button below. How we started, grew and improved! In 1997, CyberSharks.Net found its start with a web developer in need of a reliable place to host websites. He tried multiple hosting services and found them unreliable or with unfavorable customer support. By the next year, CyberSharks.Net had ordered their first web server, added an Internet connection through a local telephone company and finally had a reliable place to host new websites that continued to multiply. As time went on, word got out, and more and more people began coming to CyberSharks.Net for a reliable hosting service. 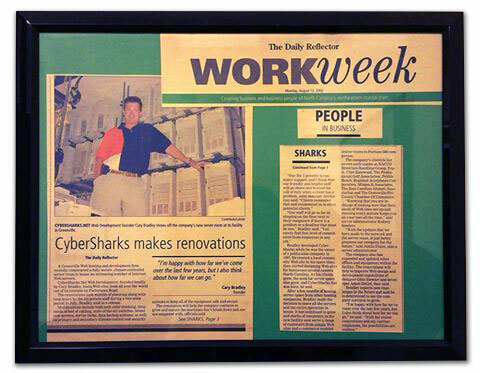 CyberSharks.Net started out in one room in an old house in Greenville, NC. It soon outgrew that space and was moved into a townhouse located just outside the city. The rooms of the townhouse filled up one by one until it was completely full and CyberSharks.Net required a larger space. As we outgrew our space we grew not only our facility, but the services we offered as well. In 2002 CyberSharks.Net began designing a new facility. Touring other data centers, getting input from clients and hired consultants, and having our employees put their heads together; a 5,000 square foot facility was built to meet our current and growing needs that opened in August of 2003. Since then we’ve continued to grow to offer Managed Services, Server Co-Locations, as well as the Web Services that started the business. With our clients we have built relationships that are truly invaluable to us locally and globally. We are thankful for all of our clients and all of the milestones we have surpassed. We are excited for the years to come and continuing to serve our current clients, the clients we have yet to meet and passing new milestones the years may bring on! Here at CyberSharks.Net we offer a variety of services that maximize productivity for your business and employees as well as increase your reputation with your clients. We work 1-on-1 with our clients, so when you call, you'll always talk to a real person and not an automated voice service. © 2019 CyberSharks.Net. All Rights Reserved.